Disclosure: This is a sponsored conversation written by me on behalf of Glad & Hidden Valley Ranch. The opinions and text are all mine. I don’t know about y’all but I love a good cheeseball. I mean, cheese. In a ball. Need I say more? What’s not to love? Cheese and crackers are a simple treat we all love. 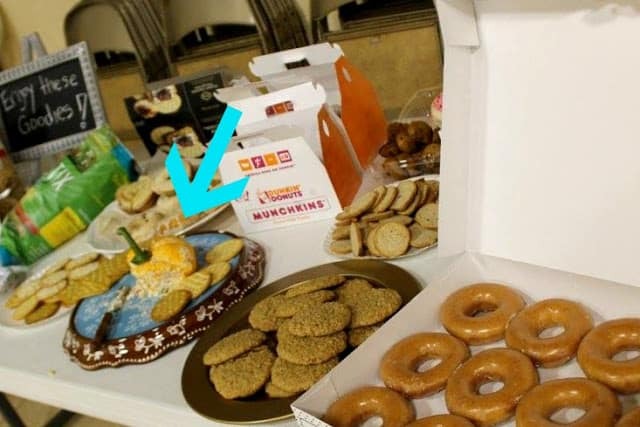 If I see a cheeseball on any food spread, I am heading straight to it. 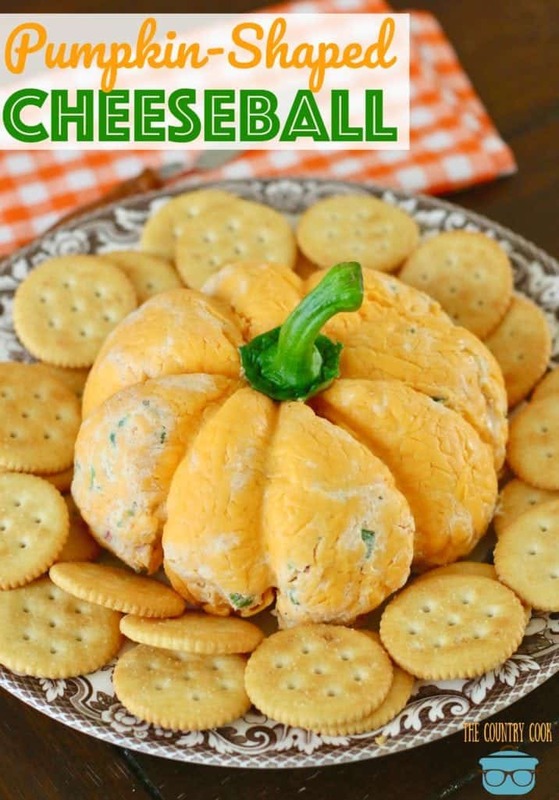 With this recipe, I knew I wanted to create a pumpkin shaped cheeseball for all those fall festivities but I didn’t necessarily want pumpkin flavor. I wanted a true cheeseball. So I headed to Wal-Mart and walked around for a bit looking for some flavor inspiration. 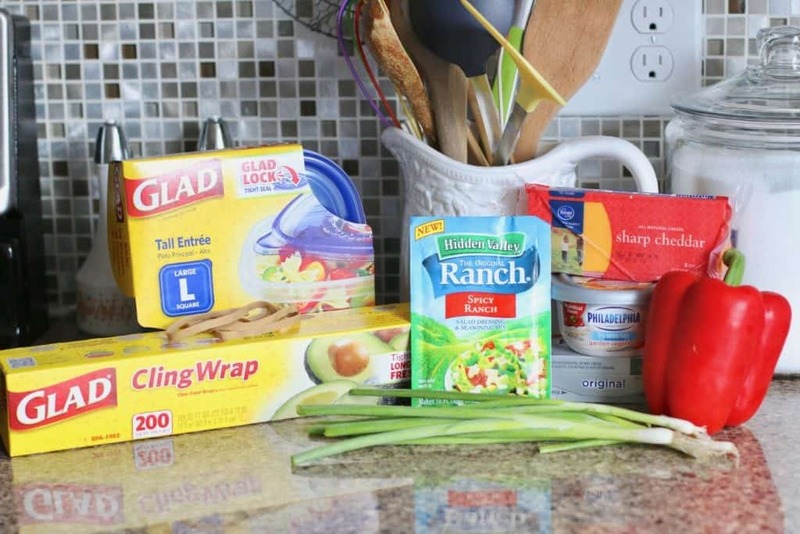 As soon as I spotted the new Hidden Valley Ranch Spicy Ranch Mix, the recipe began to take shape in my mind. So, I came home, whipped it all up, popped it in the fridge and waited. Keeping my fingers crossed that it actually tasted as good as I was hoping. The next day, my son and I were going to a painting workshop fundraiser. We were all asked to bring in some snacks for everyone to share. Little did those folks know, I was bringing in my pumpkin cheeseball for them to be my guinea pigs. I started setting it all up and I immediately had folks over to look at it and actually taking pictures.It really turned out so cute! I was so happy with it. They liked it even before I added the stem on top. Then later, after the workshop, I had several people come up and ask for the recipe. It was then I knew I had a winning recipe to share with y’all. That is always the best compliment when someone wants the recipe! Looking cute is nice and all but I wanted to make sure the taste was on point. Kinda like beauty, right? It’s nice to look cute but it’s your inside beauty that really matters.cBelow is the picture that Jess from the Art Center took of the cheeseball before we even got started painting. A whole box of doughnuts laying open and untouched and there was my little cheeseball – already half eaten. Love it! Oh and here I am with my painting from that day. We painted barns and mine actually ended up looking like a barn. Ha! Wonders never cease. And after this, we headed BACK up to Wal-Mart to get some more ingredients so I could make this cheeseball again to share with y’all. And maybe because I wanted more to eat. You don’t even have to form it into a pumpkin shape. The taste alone will make it a hit at your next gathering. What I love most is being able to make it ahead of time. You can get it all prepped and ready to go, wrap it in Glad ClingWrap, pop it in the fridge and the next day, you are all ready. The only thing you have to do is set it out with some crackers. Boom! And who doesn’t love easy – especially around the holidays! But I’m going to show you how easy this really is. Some Glad ClingWrap and a few rubber bands and you turn this cheeseball into a great pumpkin! Finely chop the red pepper and green onion. You want small pieces, not big chunks. 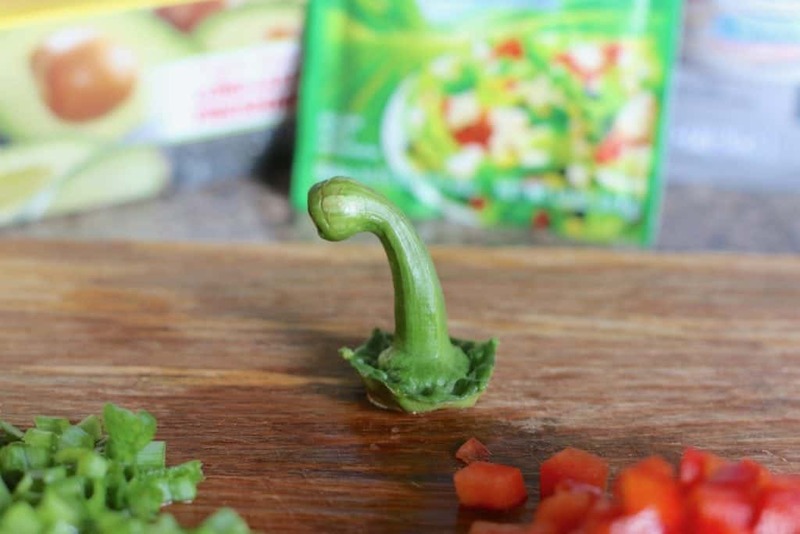 Be sure to save the stem of the red pepper. It’s going to be our pumpkin stem! I just wrap the stem up in a slightly dampened paper towel and wrap that up in some Glad ClingWrap and put it in the fridge until I’m ready for it. 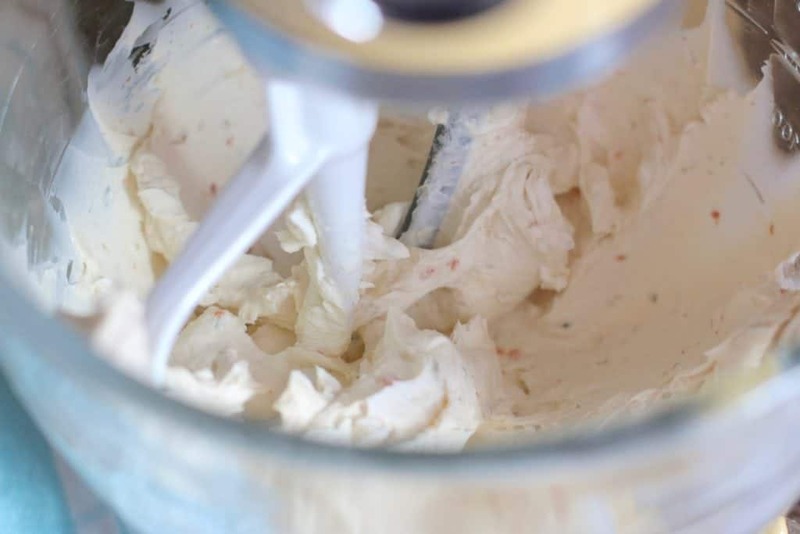 Using an electric or stand mixer, combine both cream cheeses. Then stir in 2 tablespoons of Hidden Valley Ranch Spicy Ranch mix. Note: This was not spicy in this cheeseball at all. It just gave it a small kick of flavor. 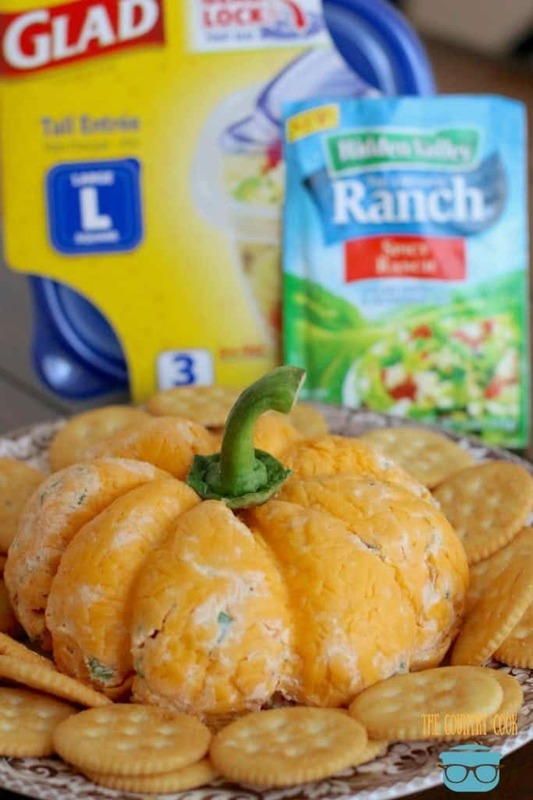 You can always use the Hidden Valley Original Ranch flavor for this! Then gently stir in green onion and red pepper. I love the orange-ish color the Spicy Ranch Mix and red pepper adds to the mixture. 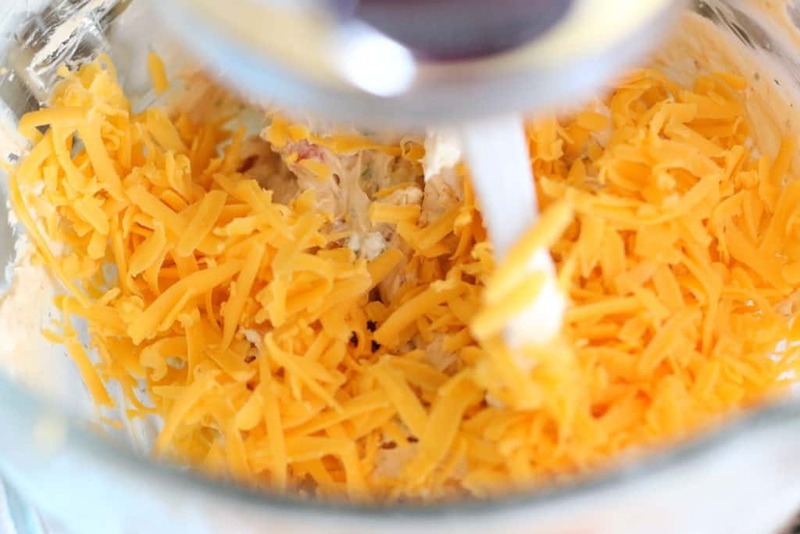 Finally, stir in one cup of shredded cheddar cheese. Spread out a large sheet of Glad ClingWrap. 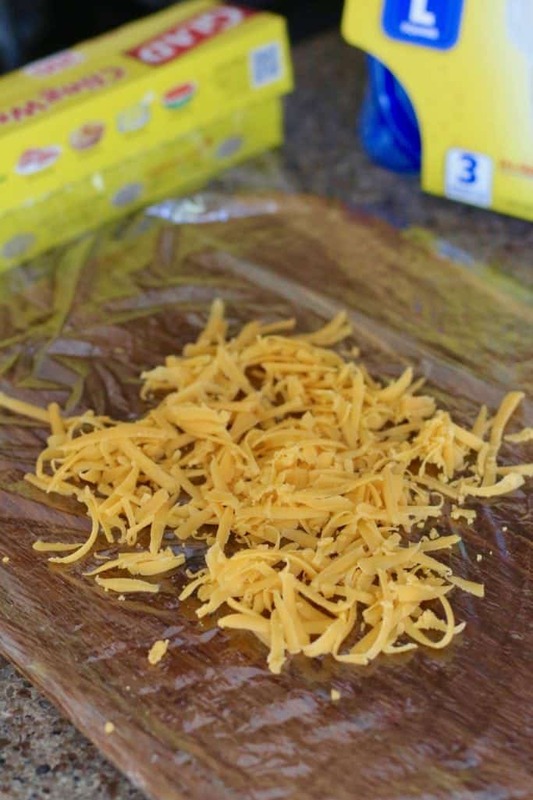 Sprinkle about a 1/4 cup of the shredded cheddar cheese onto the plastic wrap. Then top with cheeseball mixture. 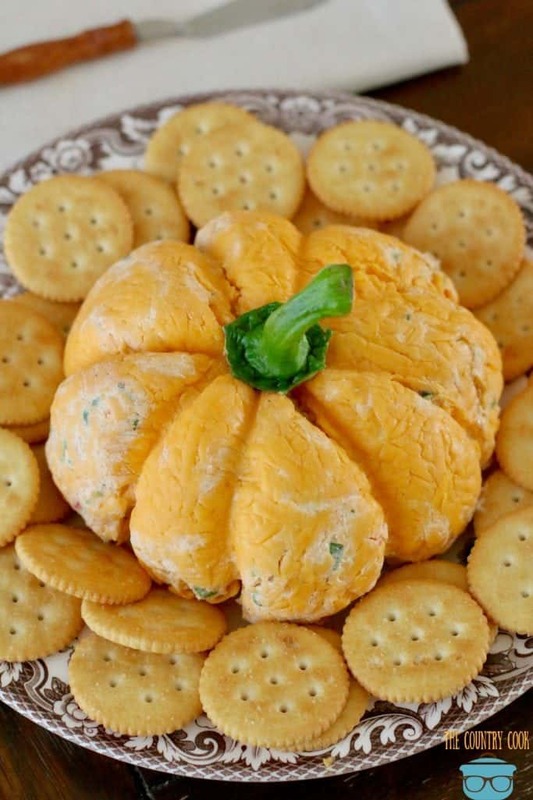 Take the rest of the shredded cheddar cheese and sprinkle it onto the tops and sides of the cheese ball. Now wrap it up well with the Glad ClingWrap. I do two layers of cling wrap. It needs to be well-wrapped and wrapped tightly. Now, time to wrap it up with rubber bands. You can also use kitchen string for this. You will need 4 large rubber bands. This is why it’s important to have a tightly wrapped cheeseball with two layers. We don’t want any cheeseball mix squeezing out while we’re putting on the rubber bands. (Ask me how I know.) With these rubber bands, I had to double wrap each one to get those long indentations we’re looking for to make the pumpkin shape. You can also use kitchen twine for this if that makes it easier for you. 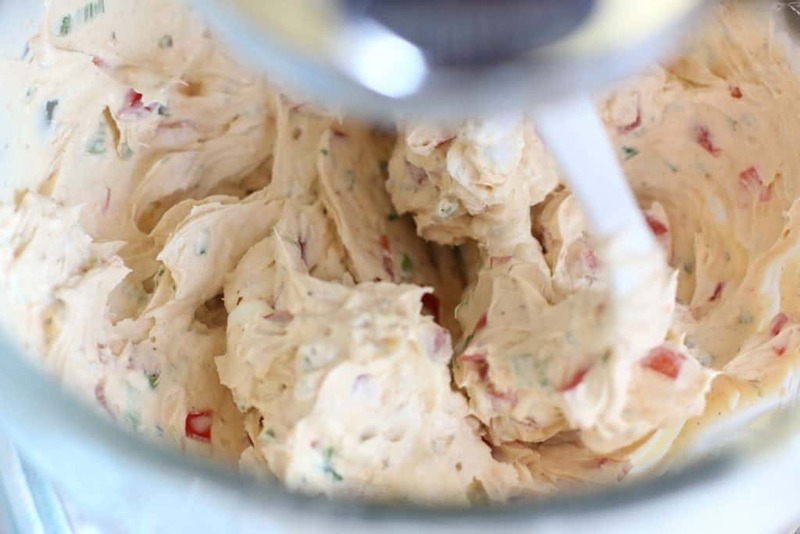 Place cheeseball into the fridge for a minimum of two hours (overnight is best.) Not only do the flavors get better as it sits, but as the mixture cools, it will help it to form that pumpkin shape. When ready, cut off the rubber bands and carefully remove the cling wrap. Then add on the red pepper stem to the top. Just gently push it in there. Serve with your favorite buttery crackers. Got leftovers? No problem. 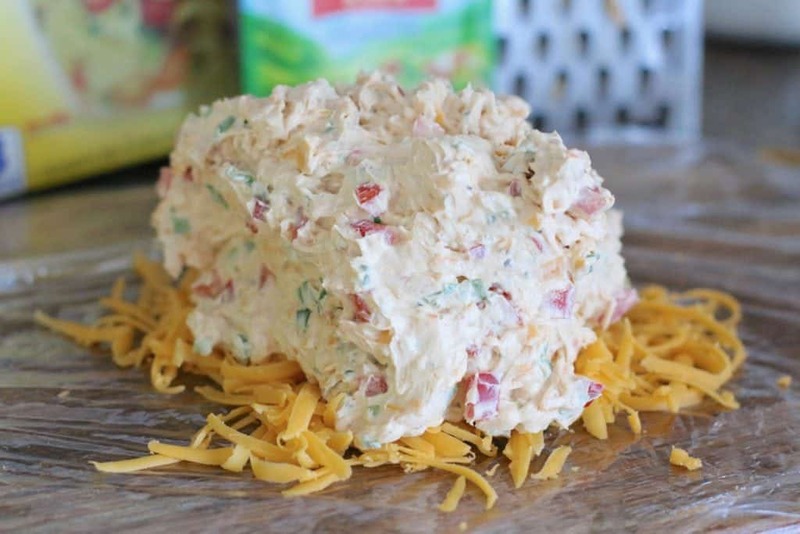 Just pop your leftover cheeseball into a tall and large Glad entree container and you’ll have it ready to snack on for later! Cook’s Note: I like to use freshly grated cheddar cheese for this. It is stickier than the pre-shredded kind and that helps when forming the cheeseball. 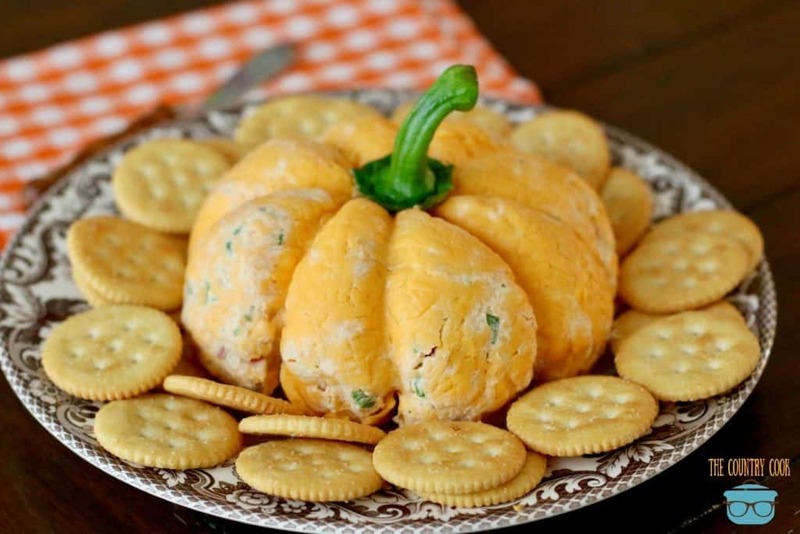 This Pumpkin Shaped Cheeseball is made with creamy, delicious, ranch-style filling covered in cheese! It's the best! Perfect for Thanksgiving. 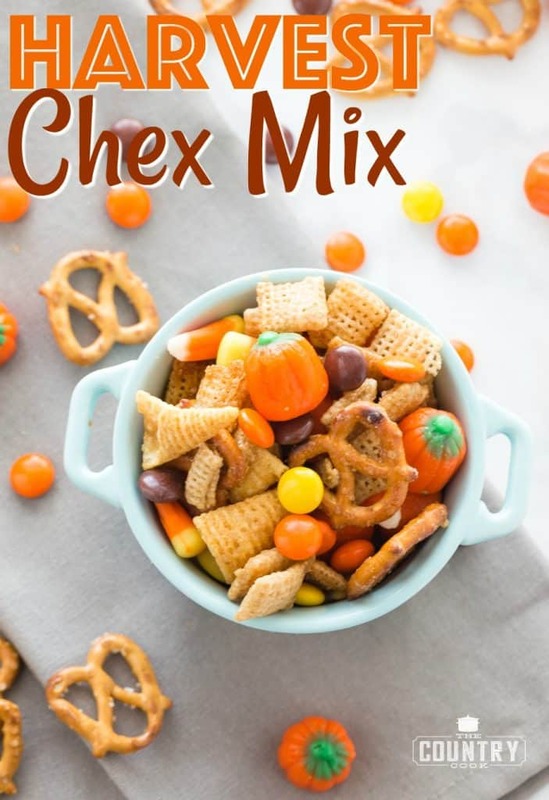 Then stir in 2 tablespoons of Hidden Valley Ranch Spicy Ranch mix, green onion, red pepper and one cup shredded cheddar cheese. Spread out a large sheet of Glad ClingWrap. 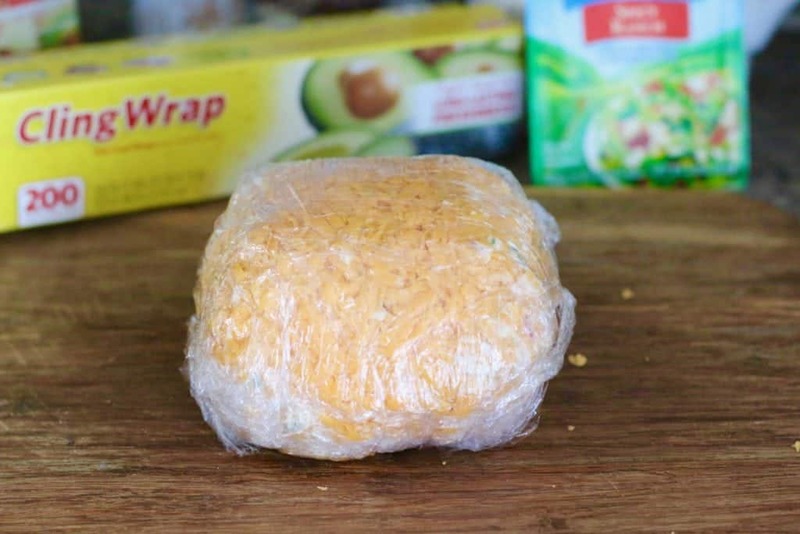 Sprinkle about a 1/4 cup of the shredded cheddar cheese onto the plastic wrap. Then top with cheese ball mixture. 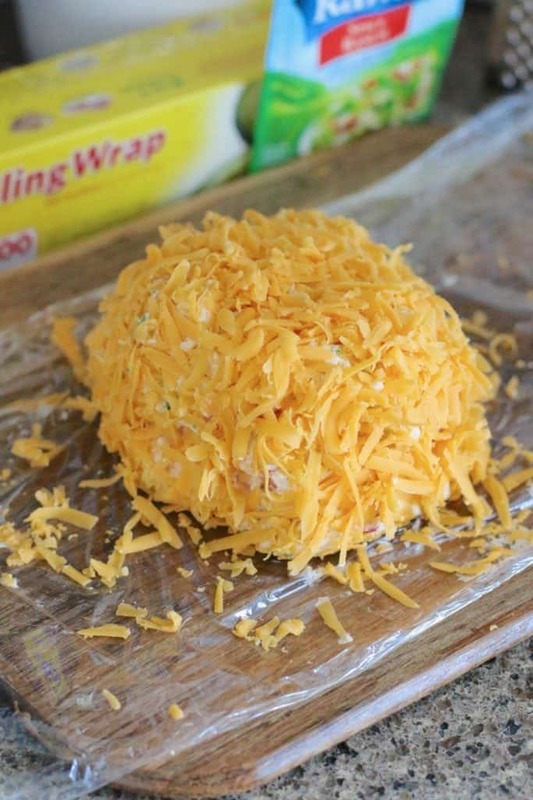 Take the rest of the shredded cheddar cheese and sprinkle it onto the tops and sides of the cheese ball and wrap it up well with cling wrap. Two layers of cling wrap work best. It needs to be well-wrapped and wrapped tightly. Now, time to wrap it up with four large and wide rubber bands. We don't want any cheese ball mix squeezing out while we're putting on the rubber bands. I had to double wrap each rubber band to get those long indentations we're looking for to make the pumpkin shape. 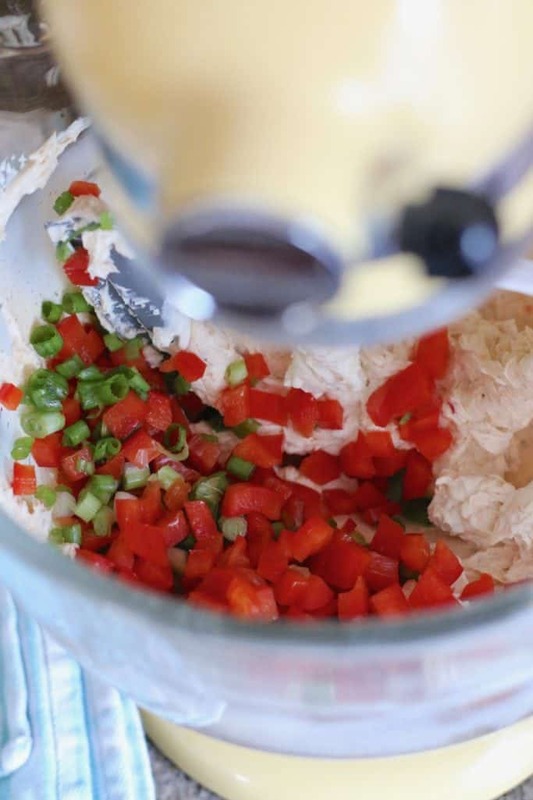 Place cheese ball into the fridge for a minimum of two hours (overnight is best.) 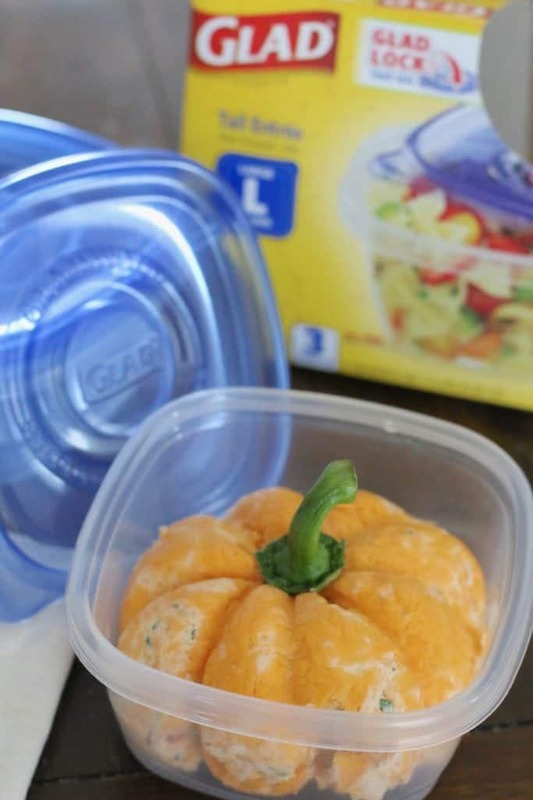 Not only do the flavors get better as it sits, but as the mixture cools, it will help it to form that pumpkin shape. When ready, cut off the rubber bands and carefully remove the cling wrap. Then add on the red pepper stem to the top. Just gently push it in there. I like to use freshly grated cheddar cheese for this. 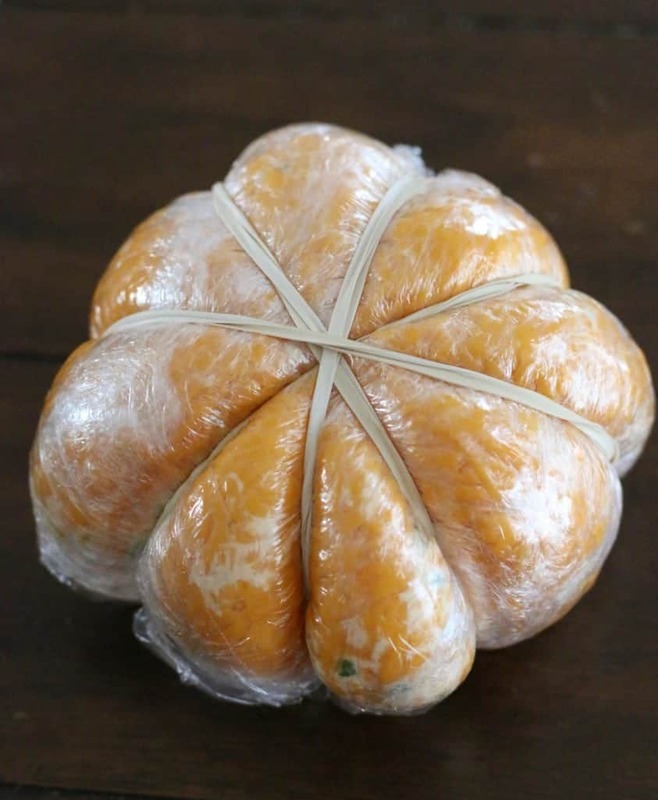 It is stickier than the bagged kind and that helps when forming the cheese ball. Let me first say that this is super yummy, super easy, and super cute!! Everyone at the pumpkin carving party loved it. Even though it’s hard to believe, I did have some leftovers and I decided to make a hot ham and cheese sandwich in my grilled cheese maker. I just mixed it up real well, slathered it on some bread, and added ham. Mind blown!!! Love it Ashley!! Glad everyone loved it and that grill cheese sounds seriously delicious! I made this for our Halloween party yesterday and everyone LOVED it. Just barely enough to feed 36 people. No leftovers. They were scraping the plate trying to get one more bite. LOL Love your recipes. They are easy and good. Thanks Linnie!! Its so easy and everyone goes nuts over it! Yay!!! Thank so much for coming back to let me know Linnie! It really means SO much to hear! This is not only a wonderful idea but tastes amazing!!!! I made it for a fall baby shower that was “pumpkin-themed.” BIG HIT! I couldn’t find the Hidden Valley Spicy Ranch Dressing Mix so I used the regular mix and mixed a tablespoon of the bottled HVRD Spicy Dressing. It worked perfectly. Crushed Cheese Pringles would look amazing on the outside…adds saltiness though! I made this yesterday for Thanksgiving and it was a huge hit! The instructions were accurate and mine actually looked like yours did! In another comment someone said they used the leftovers to make a grilled ham and cheese and my sister did just that today and she said it was wonderful and now she said it’s the only way to have grilled cheese 🙂 Thanks so much for a quick and easy and delicious appetizer. I can’t wait to take it to the next potluck at work. Hi Bonnie! You are so sweet to come back and let me know how it turned out. Yippee!! And I am totally stealing that grilled cheese idea! LOL! 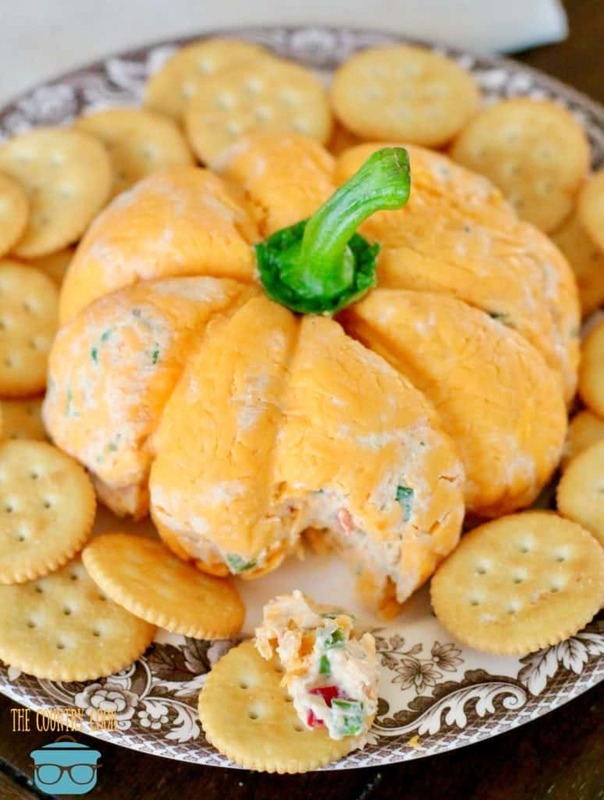 I love your pumpkin shaped cheeseball and everyone who has tried it does also. I have made the pumpkin shape but have also just made a cheeseball. This has become a regular staple at my house. I almost always keep some made up in my refrigerator. This is a great high protein source for those who are increasing protein in their diet as I do.. I have put my own twist on your recipe. I double your recipe adding green bell peppers and jalapeño peppers both finally chopped in also. We really enjoy it. Thanks for the recipe. I can’t wait to try this at my scarecrow painting party!!! It looks delicious and fits in perfectly with my Fall theme! How nice of you to share this recipe and how clever to use the rubber bands to shape it. Can’t wait to try it. Thanks, from a new subscriber and fan. It’s so hard to describe how good something is sometimes when I write out these recipes. But this is hands-sown my favorite cheeseball! I absolutely LOVE that you used the leftover to make a wrap. Brilliant! Hi Linda! They are just the large rubber band packs that I picked up at Walmart. You could also use kitchen twine and tie it off too (or any type of string or twine)! 🙂 Also, if you can’t find the spice Ranch just use the regular. I am thinking use the rubber bands to do a pumpkin shaped ice cream dessert too. Great idea !! Can you use regular saran wrap?? 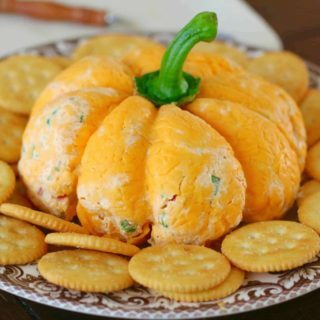 I made this awesome pumpkin-shaped cheese ball for two recent Autumn parties. It was a “double success” because not only was it cute and clever and looked adorable, but it actually tasted delicious too! This one is a keeper! 2nd year making this for Thanksgiving snack table. I made this for a “Ladies Game Night” in October and I am making it again to have for Thanksgiving. This was a HUGE hit. 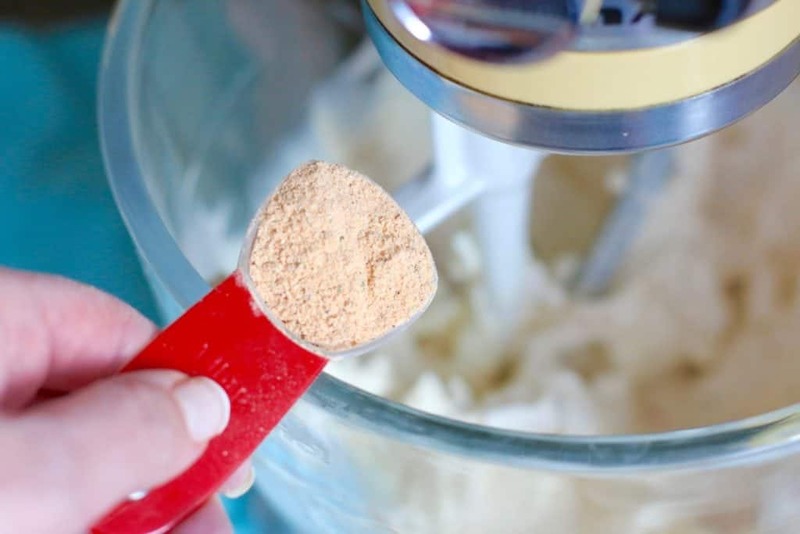 So easy & delicious, everyone raves about it. It was so easy and its so delicious and cute!! So amazed at the creativity thank you for sharing! 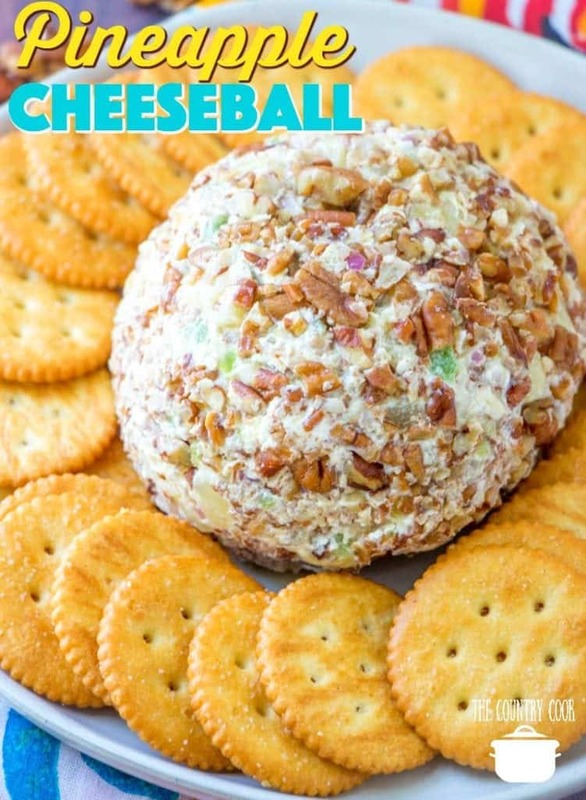 Best cheeseball ever! 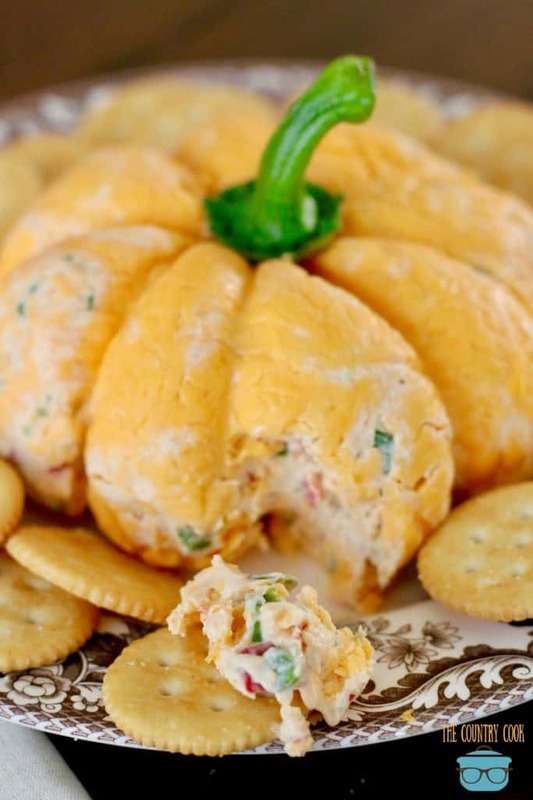 Did not make into pumpkin but served with spicy crackers as Thanksgiving appetizer. Everyone has left and eating the leftovers with a glass of wine. Perfection. Taking to my sisters for Christmas ???? Every month for our staff meeting at school a different group of people make snacks. Our group was October and I searched for fun and unique ideas. This cheese ball was amazing. Not a single bite was left at the end! Also, everyone wanted the recipe ! Thanks so much and I can’t wait to try more of your recipes! Very creative presentation! Going to use this for my vegan version for the holidays. Thanks for sharing and your photos are excellent! Found this on Pinterest. Made two of these for potluck lunches that my wife and I each had on the same day at our respective offices. They turned out fantastic, and were the hit of both parties. So simple to make, yet such a crowd pleaser. 5 stars for simplicity and for how much everyone raved about it. I made this for a work luncheon! Followed recipe except use plain ranch . It was awesome! Very simple to make and delicious! Got many oooohs and compliments! Thanks so much for sharing your recipe!! I will be checking out your other recipes !!! 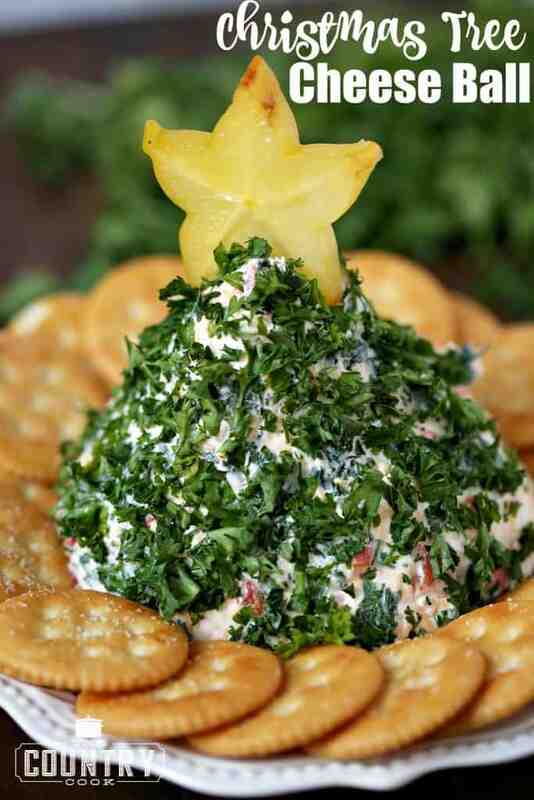 This is my go to party appetizer. Everyone love it! I just wanted to share that I also shape it into a carrot and put parsley with the stems still on at the top to make it look like a carrot for Easter. Great recipe! Thanks for sharing. Hi Pamela! That is absolutely brilliant – great idea! !